Whatever you might think of Donald Trump as a candidate, it's clear there's a significant chunk of the American population with whom his message resonates. For ostensibly conservative- and/or Republican-leaning sites like National Review and Weekly Standard to utterly reject Mr. Trump is curious, to be sure. For the pro-life constituency, embracing the #NeverTrump position is to, in effect, support partial-birth abortions. That is because rejecting Trump is tacit support for the ultra-progressive Obama/Clinton doctrine that states a baby can be ripped to pieces in the womb one second before birth. Aside from being completely illogical, championing #NeverTrump also appears to be a very, very bad business decision. According to the Alexa traffic analysis service, the leading #NeverTrump websites are hemoragging visitors and, by extension, ad revenue. For digital properties focusing on politics, this meltdown is especially damaging because the last few months should have been advertising bonanzas. Instead, the last few months have been catastrophes. 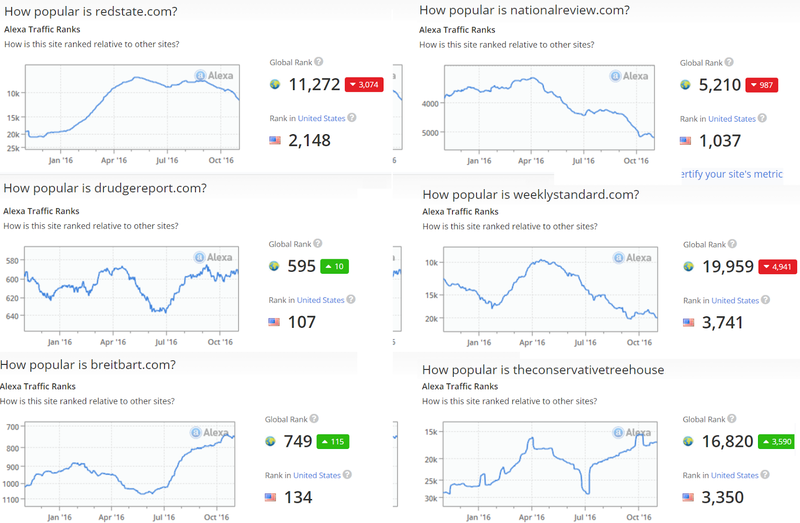 Meanwhile, pro-GOP/pro-Trump sites like Drudge Report, Breitbart, Gateway Pundit and The Conservative Treehosue are seeing -- in some cases -- astonishing traffic spikes. It's clear that the #NeverTrump position isn't just illogical, it's also bad business. No wonder traffic is surging. The Democrats chose their candidate knowing full well that Hillary was damaged goods. The goal was to get her into Office where she could do damage control and push forward an agenda. If the reports are true and this new information is released Friday the Country will stroke out, nothing like this has ever happened before. dRATS ran their Candidate; Barry will be President Unelect; and the brass ring will rightfully pass to Donald J Trump; and the American People have the teeth to make it stick. @Mr_Pinko got it right on #NeverTrumpers! Wallowing in sanctimony beats victory every time. NRO, Weekly Standard, The Blaze, PJMedia, etc. These are sites I "used" to have bookmarks for. The Blaze and PJMedia were even daily opens; not any more. Not even breaking news will get me to any of these sites. I'll wait for it to show up elsewhere now. Updating to add: I used to say that FOX News' Special Report was the best hour of news on TV - period. Now, with the panel nearly 100% nevertrumpers nearly all of the time, I haven't watched it for several months. I made the mistake of tuning in two nights ago, just in time to see Krauthammer was giving another nevertrump justification. Too bad. I really liked that show. If it's in your cable lineup,OANN's a good alternative to Fox. Don't forget that prick/douche that runs Ace of Spades. Also the cucks that ran Hot Air into the ground. We all have very long memories.